The Tor-rey TEC-250 refrigerated meat case features LED lighting to provide a brighter display of your products while uniformly highlighting your products attributes. This meat case also features a freezing lower warehouse that will prove to be a great ally in the hectic environment of any butcher shop or meat market. 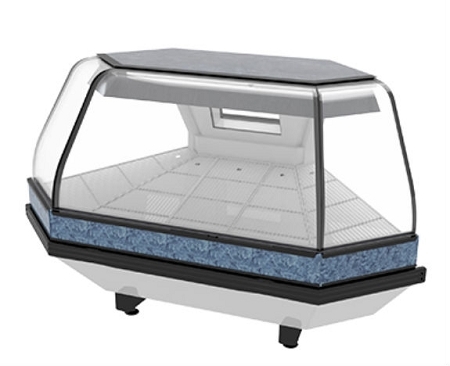 This freezing warehouse provides ample storage with a temperature that ranges from 16 to 21 degrees F. With our adjustable plastic coated shelved we've provided an easy to clean surface and a perfect set up for your product. The shelves can be adjusted to positions to easily accommodate your needs. The VTA-200 comes fully equipped with a removable work table that will allow you to cut and prep meat or poultry in no time the work table is 19" x 11", and is made of non-absorbant, odorless, and taste-free materials that meet the highest industry standards for use in food preparation of meat and poultry. This model also features a stainless steel top for effortless cleaning while providing sufficient work space to place scale, deli slicer, or cutting table if need. Efficiency is a key element that will set you apart from the competition. We provide easy access to the inside with the removable sliding doors. By removing the windows you can effortlessly clean the inside or place your products for display. The double pane rear sliding doors will also reduce heat transfer to the interior ensuring product freshness. Lastly, The TEC Series has a modular design that allows interconnecting as many units as need to customize the layout to your space needs. ETL Listed, UL and NSF Compliant.